The last thing she wants is to fall in love with a girl - especially when that girl is her best friend, Baker. Hannah knows she should like Wally, the kind, earnest boy who asks her to prom. She should cheer on her friend Clay when he asks Baker to be his girlfriend. She should follow the rules of her conservative community - the rules that have been ingrained in her since she was a child. And Baker might want to be with Hannah, too - if both girls can embrace that world-shaking, wondrous possibility. Contains mature themes. Do not pass this book up...so well written and the narrator does a great job. This is one of the best stories written in this genre...very real, believable and full of feeling...I could feel the heartache as if it were my own...its a must read/listen! honestly, I wasn't that impressed with the sample. I thought, "what the heck. I'll just get it." It's a very realistic book. It captures the inner struggle some face in regards to religion and morality when coming out. I truly loved and cared about all the characters. The author described the setting and feelings in a way where you could see it and feel it. I felt the heart break ,and I felt the love. I enjoyed the narrator as well. Just get it. What have you got to lose? Great story. Very sweet and has a happy ending thank goodness. Excellent reader as well. As I read this book I thought back and wish so much times were different when I was younger which brought so much emotion to me as I read this wonderful book. I recommend it to anyone who feels the same or just to anyone who wants a good book to read and enjoy. Thos book could have been by numbers. It isnt. sich a great exploration of what it feels like to be young and in love. My only negative is maube the boys in this book are a little too eloquent and mature towards the end. Explores many issues and handles religion especially well. The book alone is magnificent, piper’s performance is just amazing. I was so drawn to the story and the narration. Really really good story. What made the experience of listening to Her Name in the Sky the most enjoyable? I got genuinely invested in each character and what they were going through. The character development made the book whole and full of substance. I like that Hannah and Baker, while going through similar things, come to terms with who they are in very different ways. The sometimes tortured path they took was hard to see them go through, but it felt honest and real. Piper Goodeve brought all the characters to life in such a way that was touching and memorable. Her narration truly added so much to the experience of loving this book. I was moved by every part of the story and it will remain etched in my memory for a very long time. 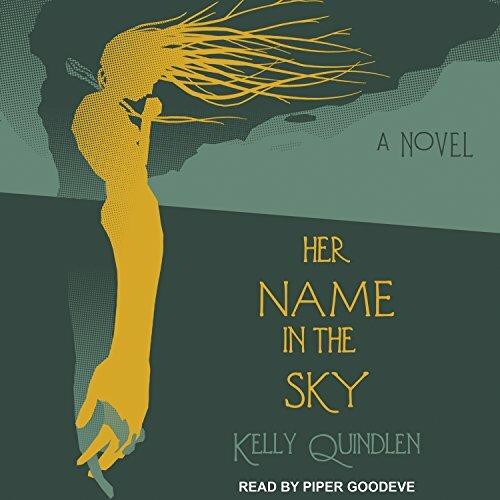 Where does Her Name in the Sky rank among all the audiobooks you’ve listened to so far? What was one of the most memorable moments of Her Name in the Sky?